Mark Anders from Adobe gave a preview of Thermo and Flash Player 10 at the 360|Flex conference. It’s a good video for designers interested in Flex-based RIA UI development and for Flex programmers interested in what’s on the horizon for designer/developer collaboration. CodeHinting.com is the blog of designer and app developer Matt Braun, owner and creative director of Magnate Interactive, a Toledo, Ohio based mobile app development company, making apps like SketchParty TV and MASH. 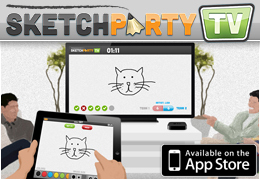 SketchParty TV is the fun, family-friendly drawing game for iPad + Apple TV. Available on the App Store. © 2008-2013 Matthew Braun. All Rights Reserved. Site by Magnate Interactive.